Darren is back after a week-long trip to California for a few conferences. The kids and I survived by keeping busy and having friends over. We had a wonderful Thanksgiving dinner with our AWF community on Friday. Last year the Thanksgiving dinner was about 35 people, including children. This year we had 60 people. It was a good thing we had already found a bigger facility to fit everyone. It was a lot of work pulling together a dinner for this many people, but it turned out well. Good food, good fellowship! What can beat that?! We are coming up on Joshua's birthday next Monday. This Saturday we are having a little party with a small group of friends. I have lots of work left in the planning, but hopefully things will come together in the next few days. I can hardly believe my little boy is turning 6 already. Well, on to the menu for the week. My friend Emily (Miss Mommy) had her baby this week, little Elizabeth Sophia (Lizzie). I was so excited to get a call in the middle of the night on Thursday to stay with her two kids while they headed to the hospital. They were home by noon the next day with a beautiful, baby girl ... CRAZY! In Scotland, they let you leave the hospital as early as 6 hours after the baby is born. Nice to be able to recover at home in comfort. Congratulations, Josh and Emily! This Saturday was Guy Fawkes Night (a.k.a. Fireworks Night or Bonfire Night). We joined several friends for a BBQ, followed by a walk down to the big Bonfire and Fireworks show. This was the first year the kids were not scared at all and really enjoyed themselves. We also got to try sparklers for the first time. Great evening! For this week's Thursdays evening "Kid's Cook", Joshua and Abigail choose spaghetti and meatballs. We'll see how it goes. I haven't really had them working with raw meat before, but they should enjoy rolling the meat balls. Here is the menu for the week. This was a weekend of family pumpkin carving. This was the first year we decided to actually carve the pumpkins instead of just painting or coloring them. The kids each chose their pumpkin from the purchases early in the week, and browsed the various websites offering free face templates to see what they liked. After the tops were removed, the kids were let loose cleaning out their own pumpkins. Joshua was very unsure about getting all gooey, but Abigail jumped right in. Darren designed Joshua's pumpkin, based on his requests for triangles, teeth and eyebrows. Do those eyes look a little like a StarTrek comm badge??? The kids were so pleased with their finished pumpkins. We selected some candles and lit them to see their pumpkin-y smiles! These cute smiley faces greeted our trick-or-treaters last night! Another week has come and gone. This weekend British Summer Time (daylight savings) has come to an end, so darkness will fall at 4:30pm. At least we have a little more light in the mornings for a few more weeks. This weekend we carved pumpkins... pictures coming soon. Tonight the kids are trick-or-treating with our AWF friends before a Halloween party at a friends house. For the next several weeks, Darren will be gone on Thursdays evenings, so I decided to make it a kid's cooking night. Last week the mac n cheese was a huge success. The kids are so excited and were more capable than I had at first thought. I'm looking forward to cooking dinners with them ... not to mention that they love eating food that they made themselves. This week we are making fish cakes, inspired by 'I can cook' on (a TV show they have recently been enjoying). Well, here is the menu for the week. During the autumn break from school, we occupied our days with friends and fun! Here are some our fun moments over the last few weeks. These pictures are all courtesy of Emily (Miss Mommy, on the left, my BFF in Scotland. She is sooooo awesome, and I just love her!! Her two children are simply fabulous as well.) Ha! Abigail and Luke dressing up! These two are great pals. They attend nursery school together, and church not to mention just about everything else. They get so excited around each other. I think we (their moms) have decided they better not sit together during the children's sermon at church any more. Last Sunday we had some jumping, dancing and just exuberant fun! Not sure what Abigail is pondering here, but it must be something great. And another set of costumes. I love the Rebekah in full armor over her bridal gown, and the knighted chicken and ballerina! Wonderful! And the kids winding down in front of a movie after a busy day of fun! The kids return to school today.They are both so excited. I'm a little sad to have Joshua gone all day again, but am looking forward to the peacefulness that school brings to our house. Both kids are happier when they have the routine and activity of school, and they get along with each other so much better when they have had some time apart during the day. Joshua lost his first tooth today! After it fell out, he literally lost the tooth as well... We can't find it anywhere! Instead of being excited, he was so upset about his tooth that he didn't tell anyone and curled up in bed this afternoon. 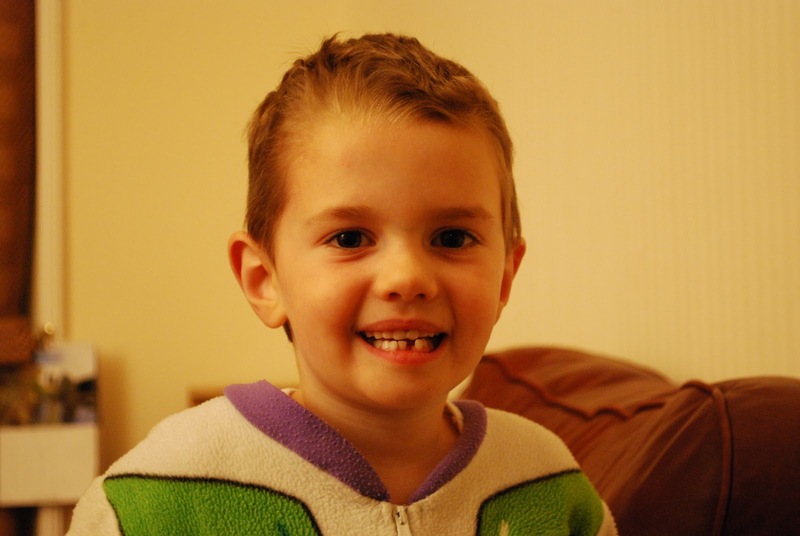 Without even knowing his loose tooth had come out, I sent him off to a friend's house while Darren and I went on a date. When I picked him up, my friend was totally surprised that I hadn't told her about it! I was shocked that Joshua never told me. He is quite excited about it now. He has figured out that this is a good thing and he can get something out of it. In spite of Abigail's claims that the tooth fairy is not real, Joshua wrote a letter to the tooth fairy explaining that he can't find his tooth, but asked if he could still get a prize. He is sleeping with the letter under his pillow right now. So cute. Another week gone.... This week the kids have been home from school on the October holidays. I recently heard that this two week break dates back to the potato harvests when the kids needed to be home to help dig up the potatoes. Joshua, Abigail and I have had fun together this last week. It is fully Autumn here and we have enjoyed the changing colors and cool evenings, though we have appreciated the mostly sunny days. We had some great craft times this week, mostly with friends and their brave mothers. We made leaf collages for the window and of coarse, leaf rubbings.We also made finger-print corns, though the little kids turned it into full-on finger painting, and Joshua used up all the extra paint painting a train and a fire station. I am struggling with my menu planning. I'm bored with all our usuals, but having trouble finding the energy to try new recipe. 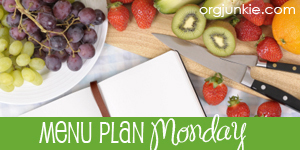 What do you do when you to freshen up your meal plan? Has another week passed already? This has been a very busy week for everyone. Darren has enjoyed the first week of school, but has so much going on that he will have to be very careful with his time in order to make progress on his thesis. The kids are on break for the next two week. After all the busyness of school, I might have a hard time keeping up with them. We are hopefully going to have plans most every morning. AWF has a great group this year. There were almost 10 new people! We start up Bible Study this week with 12 people signed up. We are looking forward to a great new year! Here is the menu for the coming week. There are a few repeats from last week because of some last minute change of plans. Sorry about the long break from blogging. We are all fine, just very busy. I am having difficulty finding time and energy for blogging. And now my computer (Darren's 5-year-old laptop) is on the fritz again, so I am without computer access much in the evenings. I have ordered some parts that will hopefully fix the problem... or maybe a new laptop is in my future. 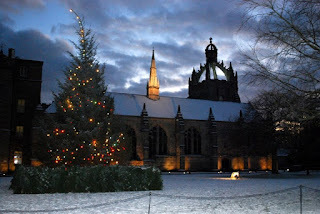 The last three days have been the best and warmest weather of the year here in Aberdeen. I think it might have even reached 70 degrees today. Beautiful! Fall is here, though, so the warmth won't last for long. We crunched on leaves walking back from school today, and the trees are all turning colors. Joshua and Abigail are LOVING school. Joshua is working on his writing skills, practicing his lowercase letters that he recognizes but never uses in his writing. They are also learning to recognize key words in their reading. Joshua thoroughly enjoys being able to read some of the words during bedtime stories. He doesn't seem in a big hurry to be reading all on his own. I can tell, though, that it will not be long. Abigail has found a whole new level of confidence being on her own in school. She really did take the lead from Joshua most of the time, so this is a stretching time for her as well. She seems so grown up now, and has her own friends apart from Joshua. It is very strange for me. She is so happy and gets so excited about preschool (nursery). We took a family trip to Edinburgh a few weeks back... I'll post pictures soon. We also had a lovely visit from my Uncle Pete and Aunt Julie. 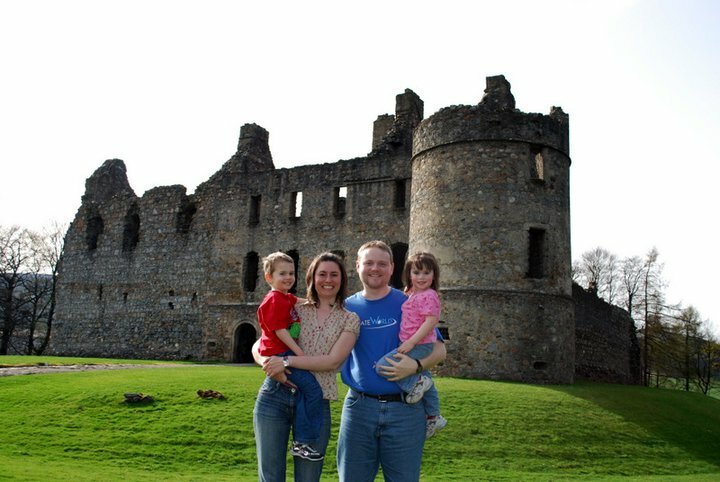 They mostly explored Scotland on their own, but they spent the evenings with us for the first week, and Abigail and I got to show them their first castle before they picked up their car rental. Darren has been very busy with conferences and articles. Now that the school year has started he is busy with tutoring and seminar, in addition to the regular load of researching and writing his thesis. As a leader in AWF again this year, my time has been spent preparing for the new families coming to Aberdeen to study this fall. With several new professors at the university, there are more new students starting this year than we had last year. This Monday will be our first big meeting of the year. I'm looking forward to meeting everyone. And our Bible Study will start up the second week in October. So, life is keeping busy. I am hoping that we fall into a nice routine now that school has started and we all have a better idea of our time commitments. But I guess so many changes just keeps life interesting. We have had beautiful weather this week. Not hot, but mostly sunny and mostly not too cold. I can hardly believe we are heading into October already. It has been nice to have a more relaxed schedule this summer, but I'm excited about all the new things coming this fall. AWF has welcomed several new families to Aberdeen this month. The PhD school year officially starts October 1. We have our big welcome meeting at my place on Oct 4, and several other welcome events to follow. The AWF Bible study will also start the first week of October. Very excited! My family loves this soup! I have been tweaking my lentil soup and am finally ready to share it. This recipe is primarily inspired by a recipe in our church cookbook and this recipe from Miss Mommy. Saute vegetables in butter for a few minutes until softened. Stir all ingredients, except the coconut milk, into the crock pot. Mix with a hand blender, or for a chunkier texture use a potato masher. Stir in coconut milk right before serving. Serve with warm, crusty bread. Enjoy! Doesn't he look so cute in his school uniform? Here all the public schools have uniforms. His school colors are grey and green, so they all wear grey trousers (skirts / dresses / etc), white shirts (primarily polo shirts) and green sweatshirts or sweaters. And all the kids has their green book bags for official communication between teachers and parents (homework, etc). He love that book bag. Proud Daddy gets to walk Joshua to school in the mornings for a little bonding time before they both head to their separate school work. And Mommy gets to greet his smiling face after school each day. I have been so pleased with the joy Joshua and Abigail have expressed in each other's new classes. 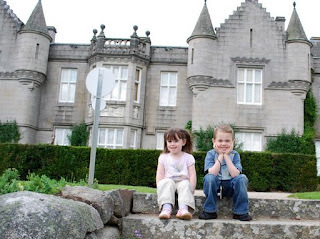 Joshua love to give Abigail tips about being in Nursery and they both are excited to hear about all that they have each done and learned at school that day. And here we go... entering the school for his first day of class. They are very gradual with the schedule changes for P1. They start in small groups of 5 or 6 for just the afternoon, with only that small group getting to know their teacher and each other. Then those kids join the rest of their class (who already started in an afternoon earlier in the week) the next morning. The entire class has 1 to 2 weeks (depending on their start day) of half days until September 5, when the schedule changes to full days, from 8:55am to 3:15pm. We had a wonderful week last week. The weather improved, at least for a few days (though there was plenty of rain in between). Joshua thoroughly enjoyed swimming lessons. He was a little nervous that first day and got out to use the bathroom several times, but quickly found his groove. By the end of the week, he was swimming for 1 1/2 to 2 hours at a time. Very fun! Abigail starts nursery (preschool) this Tuesday. She is very excited! Joshua does not start Primary 1 / P1 (Kindergarten) until next week, because of they way they phase in the students to help everyone adjust more easily. Sigh. Our summer seems to have passed so quickly, though there were some days (rainy days) when we were just ready to get back to school and routine. We spent an entire day driving around Isle of Skye. One of the most beautiful locations we visited was Faerie Glen, just west of Uig. The hills were beautifully textured with rolling waves of grass. And the green grass was dotted everywhere with white sheep and goats. In the distance, we could hear the waterfalls on the far hillside. Incredible! The sheep were still covered in thick wool because it was still spring. The sheep had mostly moved to higher pastures by the time we started our hike, but we enjoyed listening to their voices echoing in the hills. We parked our car by this loch and started hiking into the glen. We didn't have a destination, but ended climbing to the top of that rocky hill above the loch. I loved all the rocks and moss at the bottom of the glen. But we needed to head up quickly to escape the bugs in the trees. The kids were so excited about the climb to the top of this rock formation. The view was exhilarating! The kids loved climbing up and down through the glen. Joshua especially felt a courage and freedom to lead and explore. In one of the valleys between the hills there was a little fern growing on a noll; we had to take a picture of the kids admiring it. And back to the climbing and exploring... This was one of the kids' favorite stops of the day. After our wonderful climb, we had to get a family shot of the rock-hill we conquered. Check out more shots of this amazing Faerie Glen.